Wild chinchillas used to roam the coastal regions, hills, and mountains of Chile, Peru, Argentina, and Bolivia. By the 1900s, chinchillas were almost extinct. Ironically, it’s their dense, soft fur, which keeps them warm in extremely high altitudes, that lead to the catastrophic decimation of this species by humans. Between 1800 and 1900, at least 30 million chinchillas were hunted and killed for their fur, which was then exported to the US, China and other countries. By 1918, the latter countries had made capturing chinchillas and exporting their fur illegal, but it was almost too late. Since then, intense conservation projects have helped increase the chinchilla population, but it is still highly endangered. Save the Wild Chinchillas is one of the non-profit organizations on the GivingWay site. It is a conservation organization that is working to restore the habitat for chinchillas in Chile, and prevent the further destruction of their habitat. Their main aims are education, raising awareness, promoting restoration and regeneration of the chinchilla habitat, creating a knowledge base for their findings and getting as many people involved in worldwide conservation as they can. If a chinchilla mother is unable to feed her young, another female will often adopt these babies. 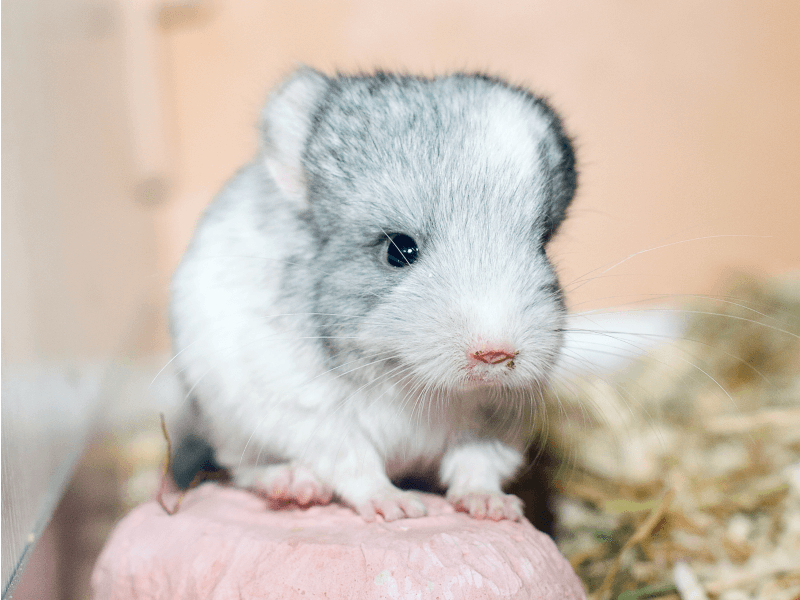 Male chinchillas are also much less aggressive than the males of other rodent species, and do not kill or harm chinchilla babies. They may even look after their young if the mother is away from the nest. We need to protect these little guys! Chinchillas have longer life spans than other rodents, often making it to their teens! Some may even live until 20 years old. These rodents have serious longevity. Chinchillas have excellent balance, and can jump as high as 6 feet. Their natural habitat of rocky, mountainous areas also means they are excellent climbers. By helping rehabilitate their habitat, you’ll help make sure they’ve got all the terrain they need to jump around. Yep, that’s how they clean themselves. If they got wet, their thick fur would take way too long to dry, so they roll in the dust to dry out the extra oils and dirt. Chinchillas are able to escape from predators by shedding part of their fur to escape sharp claws! This is known as “fur slip”. They are very social rodents that live in colonies that consists of hundreds of chinchillas. Where you will find one chinchilla, you will likely find many. These little animals have over 10 different vocal sounds! Yeah that’s right, they even have a wide vocal range so they can make sounds in different tones. Singing chinchillas? So, have we caught your attention yet? Learn more about the organization dedicated to saving wild chinchillas in Chile. If it’s not time for you to volunteer at the moment, then don’t worry. You can still help by raising awareness on this conservation project that protect the habitat for these fur babies by sharing and talking about it to your family and friends.